Boy, was I relieved when I saw photos of fashion insiders wearing sensible shoes for a change. You're all probably tired of hearing me harp on and on about not being able to walk in heels. In the recent weeks, I've had a few bloggers whispered in my ear that as lovely as Louboutins are, his heels are beyond uncomfortable. And then there was the discussion on one of Garance Dore's Pardon My French video where a few fashion heavyweights were discussing about wearing flats during the Fashion Week. Whew! I guess I'm not a freak after all. Since I'm rather vertically challenged, I prefer an inch or two extra height so that when I'm smooshed into a tube during peak hours, I'm not staring at someone's crotch or sniffing at noxious sweaty armpits. Okay, perhaps, that's too much information......but you know what I mean. I want a whole new wardrobe, I hate everything and am going through a slump phase where I just want to stay in sweats and be comfy. I think I need to stop wearing such tight clothes, I'm over it. Tabitha, really??! I thought (and still do) you look so sophisticated. The fitted look suits you. I'm with you there about comfort. I've decided that if I can't feel comfortable, there's no way I can feel good in my outfit. I'm just thinking about the Jimmy Choos that I bought for my best friend's wedding. That was the first and last time I wore them. And her daughter's turning 7 soon. That's 7 long years since I last put my feet into them. I have my eyes set on the Valentino Rosestud heels for a good while. How awesome they have them in loafers version! Number 5 is also beautiful, now i wish i can buy all. I am so not a heel person anymore and my back thanks me for it. There are times when I do like a tiny bit of height and I find that kitten heels are quite serviceable without being killer. I think we all go through different fashion obsessions depending on the time of year. Kill me now with the Valentinos!!!!! Yup, it was all you. You're a BAD influence on me. LOL! Actually, I figured if you could walk in 4-5" pencil thin sticks resembling heels, I should be able to manage 1.5 inch heels. hahaha... You've noticed that I'm slowly progressing to 2 inches now. I first saw something like these on Suri Cruise and thought they were SO adorable...these look like something even I could pull off =D (I, for the life of me cannot walk in heels). I'm actually trying to work in more heels into my daily repertoire but anything above 2" is impossible to walk in for about an hour or so a day! 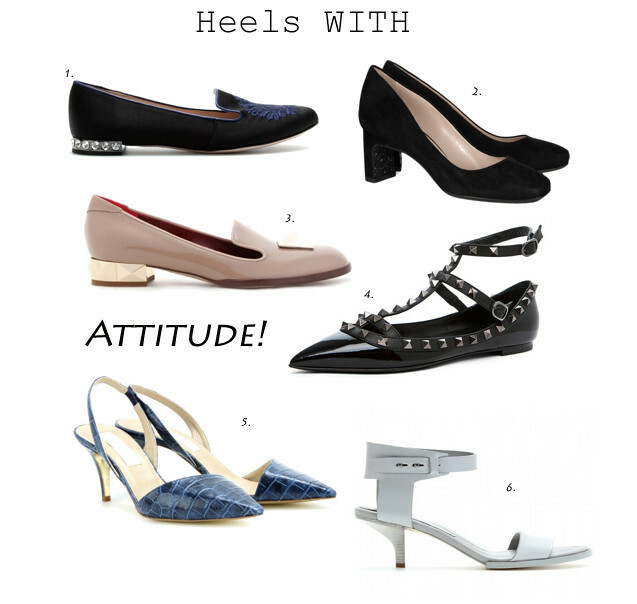 I think once you're past 30 (ok maybe I'm speaking for myself only) practicality kind of takes over, there are definitely plenty of flats with attitude (and if not, it's not hard to add a few embellishments!) and I'm really liking those Valentinos.. Totally get what you're saying here, Steph. It's actually quite a relief to hear that there are many ladies just like me who struggle to wear high heels. What? The AW was on outnet??! Bummer! You should've grabbed them. I saw the red Rockstuds and they were divine. But then again, I love the flats version too. i'm lusting over the valentino, stella and alexander! i must have self control! haha. Yes definitely! AWang has some sensible heels with attitude right now that I've been playing online roulette with. I think to ensure a graceful walk on my part, 4" is my cut off. I'm a flats girl myself. I have heels, but only wear them to dinner where I'm sitting mostly or to an occasional party. Heels have a purpose but I would never wear them walking the streets. Never! I saw those on her website and fell head over heels in love with the Valentino flats. They're just what I need too. Sorry Marlene! Saw you mentioned Garance already.